A highly acclaimed novelist now gives us a true epic: a love story that spans sixty years, generations’ worth of feuds, and secrets withheld and revealed. 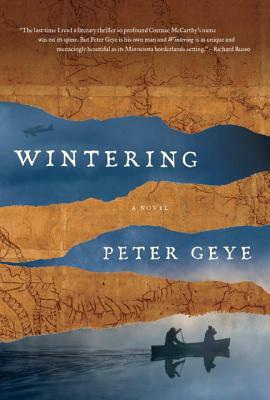 The two principal stories at play in Wintering are bound together when the elderly, demented Harry Eide escapes his sickbed and vanishes into the forbidding, northernmost wilderness that surrounds the town of Gunflint, Minnesota—instantly changing the Eide family, and many other lives, forever. He’d done this once before, more than thirty years earlier in 1963, fleeing a crumbling marriage and bringing along Gustav, his eighteen-year-old son, pitching this audacious, potentially fatal scheme—winter already coming on, in these woods, on these waters—as a reenactment of the ancient voyageurs’ journeys of discovery. It’s certainly something Gus has never forgotten, nor the Devil’s Maw of a river, a variety of beloved (possibly fantastical) maps, the ice floes and waterfalls (neither especially appealing from a canoe), a magnificent bear, the endless portages, a magical abandoned shack, Thanksgiving and Christmas improvised at the far end of the earth, the brutal cold and sheer beauty of it all. And men hunting other men. Now—with his father pronounced dead—Gus relates their adventure in vivid detail to Berit Lovig, who’d spent much of her life waiting for Harry, her passionate conviction finally fulfilled over the last two decades. So, a middle-aged man rectifying his personal history, an aging lady wrestling with her own, and with the entire saga of a town and region they’d helped to form and were in turn formed by, relentlessly and unforgettably.